This is a reprint of a comprehensive article by Brit Amos. It is a sobering essay on the effects modern technology and biological chemistry is having on our food supply. This essay will discuss the arguments and seriousness that affects the massive deaths and the decline of Bee colonies in North America. As well, it will shed light on a worldwide hunger issue that will have an economical and ecological impact in the very near future. There are many reasons given to the decline in Bees, but one argument that matters most is the use of Genetically Modified Organism (GMO) and Terminator seeds that are presently being endorsed by governments and forcefully utilized as our primary agricultural needs of survival. I will argue what is publicized and covered by the media is in actuality, masking the real problems of Terminator seeds and Genetically Modified Organisms (GMO’s). Terminator seeds; genetically produced and distributed by powerful multinational lobbies manipulate government and agricultural policy to encompass their agenda of dominance in the agricultural industry. American conglomerates such as Monsanto, Pioneer Seeds, and others, have created seeds that do not reproduce (whereas these seeds have a life span of the crop chosen). The sterilizing of the plant by the means of sterilizing the flower pollen genetically altered and mutated for production in the agricultural industry. Logic states that if the flower pollen is sterile, bees are potentially going malnourished and dying of illness due to the lack of nutrients and the interruption of the of the digestive capacity of what they feed on through the summer and over the winter hibernation process. Firstly, while there are some people who want to pin the blame on these mites, such views are unconvincing in that the argument does not make any sense because the main source of disease for these bees is intestinal disease. In fact, many bee experts assumed Varroa mites were a major cause of the severe die-off in the winter of 2005. 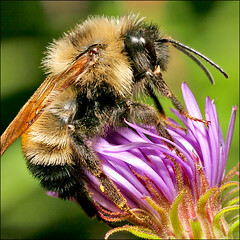 Yet when researchers from the U.S. Department of Agriculture (USDA) Bee Research Laboratory in Beltsville, Maryland, traveled to Oakdale, California, where Anderson and a number of his fellow beekeepers spend winter and spring, they could find no correlation between the level of Varroa mite infestation and the health of bee colonies. “We couldn’t pin the blame for the die-off on any single cause,” says Jeff Pettis, a research entomologist from the U.S. Department of Agriculture (USDA) Bee Research Laboratory in Beltsville, Maryland,3 However, treatments against mites may be leaving hives open to the onslaught of powerful pathogens, much in the same way the overuse of antibiotics lead to super bugs in society today. What does that say about our future? We have learned that in the 1960;s and 1970;s, among other human ailments, DDT was a major cause of cancer in humans and animals; however, the substitution of such pesticides was a closely guarded secret. Unfortunately, the long term effects on the human population has yet to be understood as the compromise of the immune system may be happening quicker than we are ready to accept, even regarding the advent of super bugs. One can see that even this medical implication has severe economical implications. Secondly; Crops and even hedges, verges, and woodlands, and even where bees remain are sprayed with pesticides or herbicides. These chemicals are the practical extension of an exasperating belief that nature is our enemy. Pouring poison on our food is a very simplistic way of dealing with our problems however it ignores the root causes. New genetically modified crops, designed to be immune to certain pesticides and herbicides, have resulted in the increased usage of these chemicals. Pesticides, particularly Bayer’s imidacloprid, a nicotine-based product marketed under the names Admire, Provado, Merit, Marathon, and Gaucho have been concretely implicated4 in the destruction of bee populations before (see also)5. The fact that other bees and insects are not raiding deserted hives to feed on the honey as they normally would lends some credence to the theory of a toxic overload. The toxic overload is certainly a concern, but wouldn’t it also need to be considered that this is systematic in the degeneration of the digestive process, such as in humans inability to digest preservatives and not absorb the enzymes to break down the foods eaten for survival? Lastly, Leaked documents seen by the Guardian show that Canada wants all governments to accept the testing and commercialization of Terminator crop varieties. These seeds are genetically engineered to produce only infertile seeds, which farmers cannot replant, also to mention that the bees that are trying to collect pollen, found to have their digestive tract diseases, such as amoeba and nosema disease8. These diseases are mainly located in the digestive tract system. After studies of the autopsy, the most alarming trait is that the lower intestine and stinger have discolored to black vs. the normal opaque color, Synominus with colon cancer in humans. When thoracic discs were cut from sample Georgia A-2 the musculature of bees was notably soft and discolored (A) when compared to healthy thoracic cuts (B). The Ecological Impact of horizontal gene transfer and increase of rampant disease is not fully examined and if so, is kept silent by these Conglomerates. The Economic Impact of the Colony collapse would mean higher inflation, scarcity of agricultural goods, and ultimately the collapse of North America Agriculture Business. Vidal, John. â€˜Canada backs terminator seedsâ€™, The Guardian. Wednesday, February 9, 2005. With all due respect, you should have a closer look at what the science is suggesting rather than laying the problem mainly at the door of GMO.